LOVE this set. It is going to look amazing sitting on the quartz countertops in my kitchen. Much better quality than I had expected. Packaged great upon arrival. 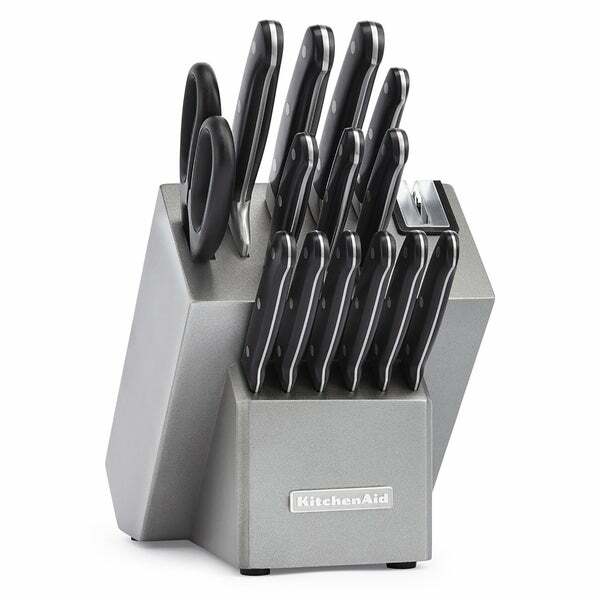 Outfit your kitchen prep area with this KitchenAid cutlery set. This 16-piece set comes with paring, santoku, steak, utility, bread, chef, and slicer knives, so you have the right tool at your fingertips for all prep jobs. Store the knives in the included storage block to keep them free of damage. This has been an excellent set of knives for my family. We are intermediate level cooks, and I chose this cutlery after researching all of the top brands. I love the knife selection in this set. I still have a tween at home who is learning, and this is a safe set for her as well. Sometimes one of the family might forget to wash and dry, but I have had no issues with spots or rust. Normally I do hand wash them though. It's not a big deal either. The knives have been used for about two months now, and I would highly recommend this set to my closest friends. Thank you KitchenAid for another great product. Overstock offered a great deal and I couldn't be happier with their service. ....A very satisfied customer!!!!! The block has a built-in sharpener and the color complements my stainless steel appliances. There are a variety of knives which appear to be good quality. I trust the KitchenAide name and am very happy with my purchase. This is a great knife set. Very complete set and I really liked the sleek look of the stainless steel. Shipping was quick. Highly recommend! Wonderful knife set! Look great and the weight/balance feels just right. The quality of the German steel is evident and they sharpen easily on the block. well crafted knifes.the knifes go all the way through the handle we love this set so with the sharper and all I would highly recommend to anyone. There is not one complaint I can make about this knife set. I have other kitchen aid products and it’s just honestly a great brand. I haven’t had to hardly sharpen the knifes at all and bonus if I do it has a built in sharpener! This was such a great buy for my family! LOVE this knife set! I wasn't sure I'd use so many knives, but we do all the time! Highly recommended! This knife set is beautiful! Love the display. The knives are perfect. They are very sharp and work very well. Presentation of the knives on the counter is simply beautiful. Better than I expected!! I would recommend this everyone! This set was everything i would expect from kitchen aid. We own many other kitchen aid products and will continue to buy them. The built in knife sharpener is very handy. Love!! Functional, stylish and at a great price. Very nice looking set of knives. The blades are pretty sharp and seem sturdy so far. Also has the knife sharpener in the block. Wonderful knife set that has all the knives I need for some basic cooking. It's not professional or anything but it gets the job done well enough. The sharpener is fabulous and the knives are good, too. My wife and I needed a new set of knives for our home because we didnt have any but these have been absolutely fabulous. We're extremely pleased with the sharpener and the set itself. "IS IT MADE IN USA?"